for your wedding, party, bar mitzvah, corporate gathering, family reunion, etc. Different sized groups (solo performers, duets, and bands of any size) can be assembled to fit your party and budgetary needs. A party with live music is a CLASSY party, whether it's a formal sit-down dinner or a backyard barbecue!! We can provide background music, music for your ceremony (including processional and recessional) and of course music for your reception. Please feel free to email us or phone us at 510-848-5018 with any questions you may have. Below are a few samples of ceremony music we can provide. We are also open to learning special requests for wedding ceremonies. Some Kind of Love: This beautiful love song is one we have performed at many weddings. Processional: Inspired by a folk tune from Finland. Here it is played on two guitars; we often play it using violin and guitar. Recessionals: Two tunes that we have played for recessionals are Wild Hog in the Woods, an uptempo, lively old time mountain tune, and Salt Lake City Blues, a hillbilly jazz piece. 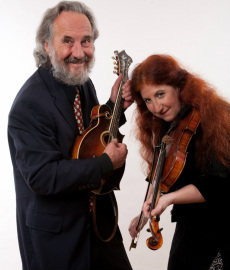 Cajun and Zydeco, bluegrass and old-time mountain music, jug band blues, 1920's hillbilly ragtime, Klezmer, Country and Folk music, Irish jigs & reels. We can create a custom mix especially for your event. If you would like us to include repertoire that reflects your family's ethnic heritage, please inquire; we play tunes that come from many traditions: Greek, Mexican, Hawaiian, Italian, Puerto Rican, etc. We can provide a sound system; but we also specialize in playing acoustic music without any sound system, perfect for situations where amplified music is not permitted, or where there is no electricity available. Liven up your party by filling up the dance floor! 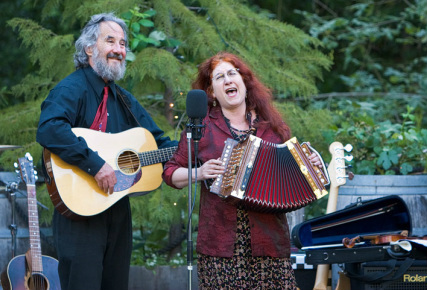 We specialize in acoustic grassroots dance music: Cajun-Zydeco and jug band blues, old-time fiddle and banjo music with a caller who can teach all the dances, Jewish folk dances for your wedding or bar/bat mitzvah. Our dance teachers can provide informal instruction for even completely inexperienced dancers. Guests of all ages love to dance and it is a perfect way to bring together the generations. Thank you SO much for your stellar performance at our wedding. 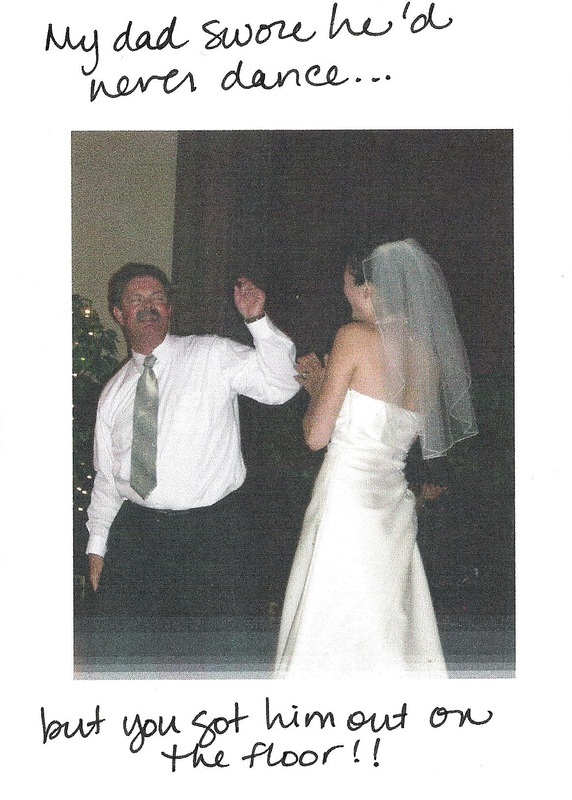 My dad swore he'd never dance...but you got him out on the floor! We had been billing the music as a major attraction for months and folks were really excited about it -- but it was a hit beyond our wildest dreams. Y'all were just the right mix of laid-back, romantic, foot-stomping & passionate for everyone to enjoy. The music was wonderful and made a huge contribution to an amazing evening. Thank you!! Thank you, thank you, thank you for making our wedding so joyous and wonderful. Our guests couldn't stop dancing and you kept on playing! 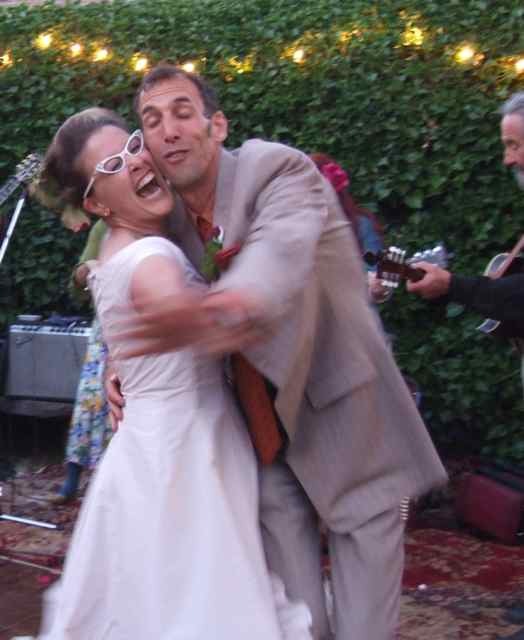 Here is a picture from our wedding - what FUN!!! Thank you all again, heaps - for making the evening FABULOUS! Everyone was enjoying themselves! We want to thank you for a wonderful celebration you helped to create last month in Palo Alto. Our friends and families were delighted to dance to and hear your lively and invigorating music. And it meant so much to us to have "California Stars" as our first dance and to share it with everyone. We will never forget that moment...thanks for creating it, and for your incredible and patient flexibility, up to and including the day of the wedding! Suzy, Eric, and the band were terrific. The music was very lively and fun, and tons of our guests made a point of telling us how much they enjoyed it. Lots of people went right out on the dance floor when the music began and stayed for the remainder of the evening. And I think people found the sound very unique. The other thing I really appreciated was how non-intrusive the music was. The band started playing during dinner and didn't interfere at all with conversation. (I've been at many weddings where the music was simply too loud.) They were also very easy to work with in the months before the wedding, giving us suggestions for first dance songs, sending MP3 files electronically (we were doing all the organizing for our California wedding from the east coast), and answering all of our questions speedily. During the wedding they were very flexible about timing and about the shifting schedule for our first dance, cake cutting, etc., even lending their PA system to those making toasts. All and all, we were extremely happy that we chose them for our wedding, and would certainly do it again! Thank you so much for a wonderful evening! Alison and I absolutely loved your music and had a great time. We received many great comments from our guests about how much they liked you guys and how perfect the music was for the wedding and ranch. We have been wanting to convey to you our most sincere appreciation for the efforts of you and your colleagues during the day of our wedding. The ceremony music (before,during, and after! ), the reception music, and the American- and Israeli-folk dancing were all exactly what we wanted, and your style blended seamlessly with the other wedding elements to enhance the mood we were trying to create both for ourselves and for our guests. Thank you for helping to make our wedding day so special! Thank you again for your wonderful music. The melodies really set the tone for the day. You guys tuned in to what we needed. You just flew with it and made it a great day. Thank You, Thank You, Thank You! The music at our wedding was perfect. Everyone was thrilled with it, *especially* the people who gave us a "confused look" when we told them we were going to have Cajun music at our wedding! Your mix of tunes and tempos truly helped set (and match) the mood of the party. We've received countless comments regarding how awesome the music was! Also, you guys were a pleasure to work with. From the very beginning, you were totally responsive to our requests and very helpful in figuring out the musical aspects of the day. Our wedding had some complicated aspects to it, and you were perfectly willing to go with the flow, and adjust the "plan" to whatever was going on at the time. That was a huge contributor to how wonderfully the day went for all of us. You're the best! The music at our wedding was simply superb! It set the right tone when we were eating and couldn't have been more fun to dance to for the rest of the evening. Many guests told us that they have never heard such great playing and had such a great time dancing at a wedding. How can I thank you? You and your band did such a wonderful, amazing job. SO many people asked about you and SO many people danced -- I was shocked. They said they couldn't help it. Quite a testimonial, eh? 2. Type of event. Is it a party, a corporate event, a wedding, birthday celebration , graduation, bar/bas mitzvah, or something else? 3. What is the location of the event? Indoors or outdoors? Private residence or rented hall? Is amplified sound permitted? 5. What is the entertainment budget? 7. Would you like dance music for your event, or background music, or both?